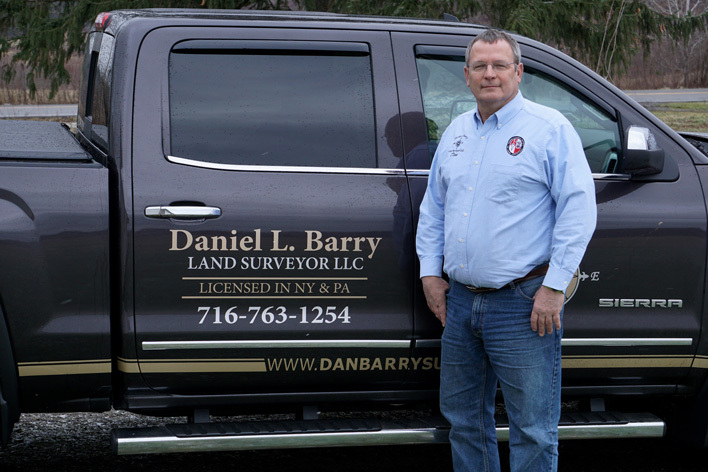 Daniel L. Barry Land Surveyor LLC was established in 1986, with the owner receiving a New York State land surveyor’s license in September 1981, and a Pennsylvania land surveyor’s license in August 1988. We provide all types of land surveying services, generally in southwestern New York and northwestern Pennsylvania including Warren Pennsylvania. For larger projects, we will travel into most areas of New York and Pennsylvania. Some of our larger clients include the Natural Resource Conservation Service and the USDA Forest Service. We strive to utilize the appropriate surveying tools for the individual project, ranging from compass and tape for rural, wooded boundary line scouting to total station and data collector to GPS equipment. We have dual frequency RTK & Static GPS equipment to enable us to provide “real world” control data for your project, if so desired. All drawings are prepared on computer and can be delivered electronically, upon prior request, to an appropriately licensed engineer or architect, in AutoCad DWG, MicroStation DGN or PDF formats. The philosophy of our land surveying company is to provide the highest quality services to all of our clients in a timely manner, and at a reasonable cost.